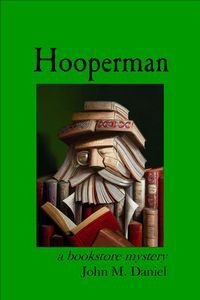 Hooperman by John M. Daniel: Synopsis and Online Purchase Options. Synopsis (from the publisher): Hooperman Johnson is a tall, bushy-bearded man of few words. He works as a bookstore cop, catching shoplifters in the act. It's a difficult job for a man with a stammer, but somebody's got to do it, because Maxwell's Books is getting ripped off big-time. And, more and more, it looks like the thief works for the store. Who's stealing the books? Martin West, the foul-mouthed nutcase in charge of shipping and receiving? Millie Larkin, who hates the boss because he's a man? Could it be Lucinda Baylor, the dark and sassy clerk that Hoop's in love with? Jack Davis, the socialist, or Frank Blanchard, the anarchist? Or maybe even Elmer Maxwell himself, the world-famous pacifist bookseller? Set in the summer of 1972, the summer of the Watergate break-in, this is a bookstore mystery without a murder, but full of plot, full of oddball characters, full of laughs, and full of love, some of it poignant, some of it steamy.